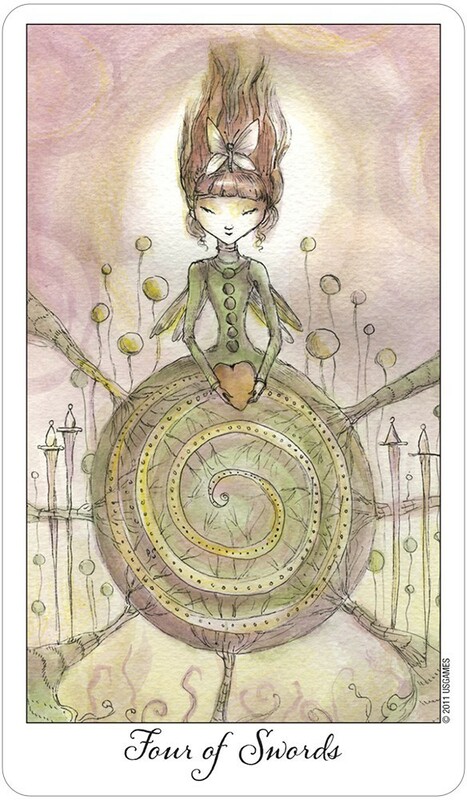 Popular tarot artist Paulina Cassidy has filled both the Minor and Major Arcana with charming new characters that bring their inspirational messages of joy to everyone. Those who take a journey through this wondrous realm will rediscover their own child-like spirit. 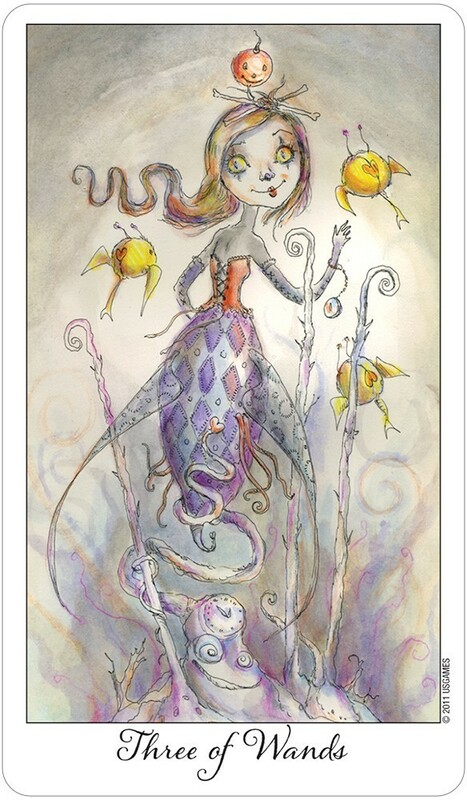 French for “joy of living”, the Joie de Vivre tarot deck is designed to access the child-like energy in each one of us to help stimulate, enhance, and inspire joy in our own lives. The living beings in the Joie de Vivre realm that inhabit this deck are all sentient souls of love who want nothing but the best for those who take a journey through their world. They will help you tap into intuition and connect to divine source. Joie de Vivre Tarot deck will help awaken a response from deep within your heart, mind, and spirit. 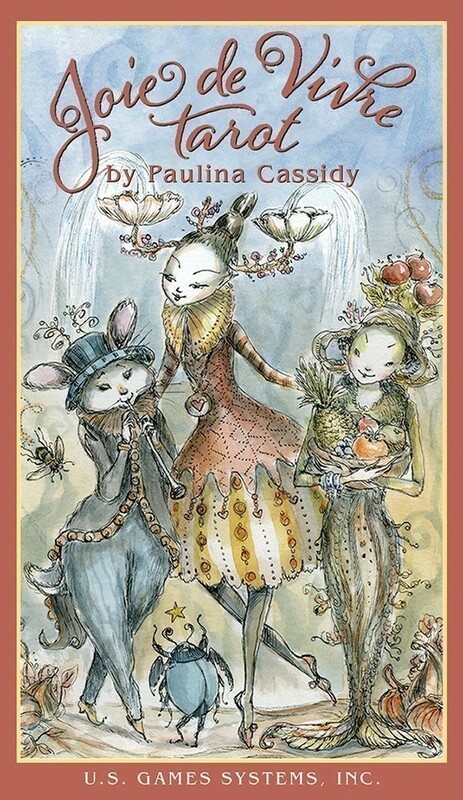 Paulina Cassidy is the creator of Paulina Tarot, Witchlings Deck and Book Set and Spiritsong Deck and Book Set published by U.S. Games Systems, Inc. Her unique vision, fantastical style, and fanciful designs are loved and collected worldwide. 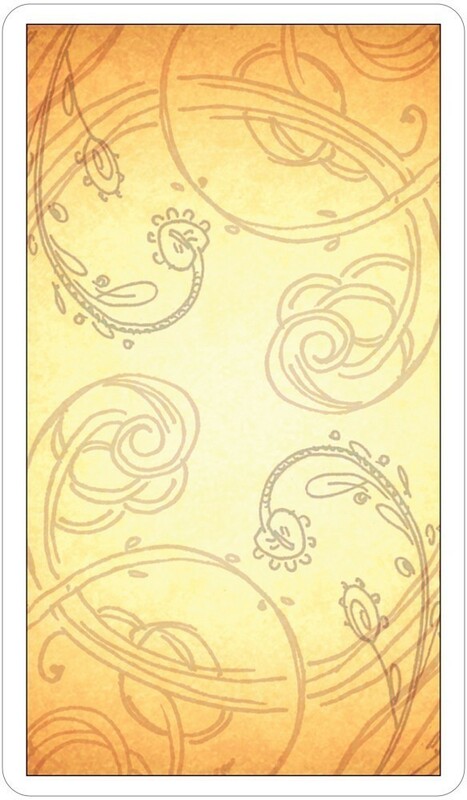 Joie de Vivre was voted Top Ten Most Popular Tarot Decks of 2011 by Aeclectic Tarot. 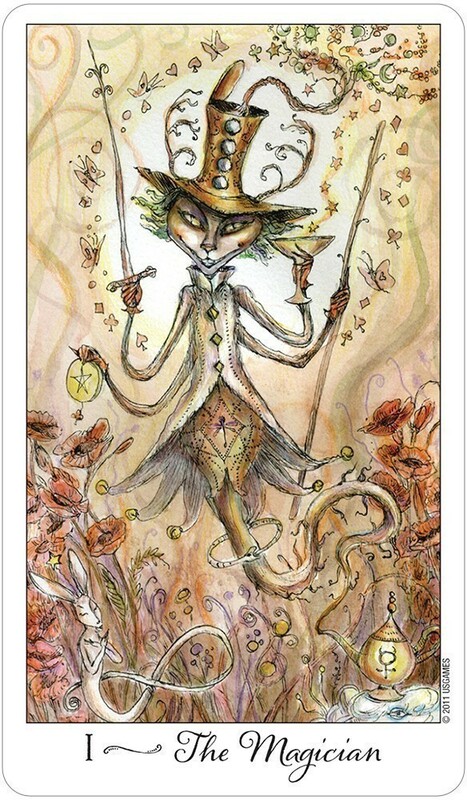 Joie de Vivre was chosen as one of Tarotize's Top Ten Tarot Decks of 2011 and was named Favorite Whimsical Deck. I can review this deck with one word -- "whimsical" -- it's like cute Goth. The colors are in the pastel range, in a way that seems to dampen the gloss from the cards. Shady but definitely not dark. The queen of cups is a mermaid with a blue heart on the end of her tail; she is sitting on a rock delighted by a couple of fish jumping out of a large cup. The water is a grayish blue and the sky is kind of yellow, reminds me of hazy morning light. The creepy does come through. The queen of swords is wearing a worn dress, messy hair, skulls hanging from her waist and a rickety sword in her hands ... she looks annoyed to say the least. But then you see the Devil and he’s not as scary as in other decks. Oh, he looks mischievous, with his wicked grin and cricket style legs/arms. He has shrunken heads hanging from his shirt and has a person on marionette strings. He reminds me more of a street performer. These cards are full of so many intricate details that you could spend hours just looking through the cards. They could easily serve as your go-to deck for readings. 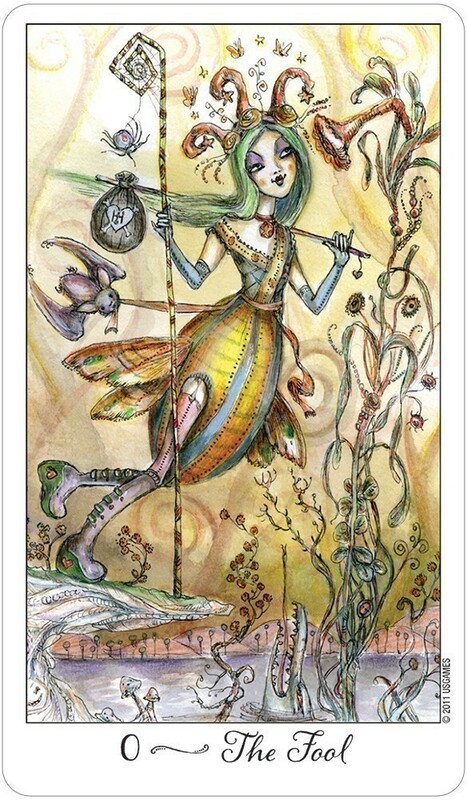 Paulina Cassidy has created the charming Joie de Vivre Tarot. Her style of art, her use of color, her images, are so delicate and perfect! I have not set it down since I received it! French for 'the Joy of Living' the name truly captures that child-like joy and essence. I have searched through the deck to find a favorite card, to display for my review, and cannot find just one! So being the Pisces I am, I chose 'The Moon.' I also love the night, and the music of the night. Paulina has named Phantasm, with an audience of 3 mesmerized white owls, named Haze, Daze and Maze. Owls, the symbol of Wisdom, just look into their little faces, they are lost in the watery world of stars reflected on the peaceful water of the night. And a colorful dragonfly sitting on the end of the violin, cannot get close enough, I think. How creative and lovely, not a style many may copy! We moon people delight in being different, in every way imaginable. The last thing I notice is the golden glow of the stars surrounding her as she lights up the night. A lovely lady of mystery, and wonderful card to meditate on. What wisdom do the white owls hold for you? Take time to sit with them awhile, and see what your mediation reveals. A must have deck for any Tarot Reader. Even the Rider-Waite diehards will enjoy this one, as on each card, is a symbol from the most traditional Tarot decks. You just have to look closely, and see what else is hidden within each playful card. Enjoy! The images of Joie de Vivre Tarot are unmistakably the work of Paulina Cassidy. They are fanciful, otherworldly, and, at times, macabre. It seems to me that in her first deck, Cassidy was trying to hold back just a little, maybe trying to be a wee bit tarot-proper. In this deck, she has given us a full view of the landscapes inside her head. Many of the characters have sweet faces with big eyes and pointed chins. There is a very Victorian feel to the deck. There are clever elements to the images, such as the clock in the hair of Lady Temperance. While the images on the cards are certainly non-traditional, they make sense, and are delightfully imaginative. I found this deck to be highly useable and a delight to read with! In the introduction, the author describes the deck as "designed to access child like energy in each one of us to help stimulate, enhance and inspire joy in our own lives". While that sentence may hold true, don't underestimate this deck as some tarot lightweight. I’ve gotten some deep insights and clear answers from it. I always appreciate the quality of US Games card stock -- once again, this is a sturdy one that will hold up well to years of tarot readings. This is a really important selling point for me. There is nothing worse than a flimsy deck -- but you never have to worry about that with this publisher. 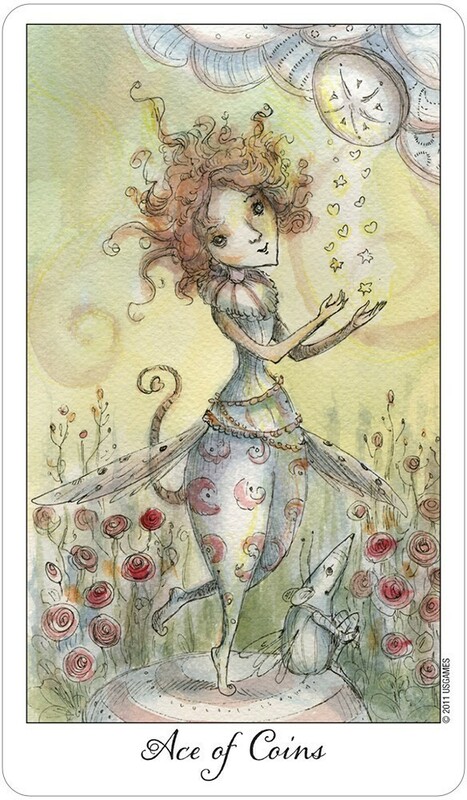 The images on the cards are whimsical with fantastical creatures that convey the messages in a playful manner. From the Mad Hatter-like Magician to the space mouse on the 8 of Wands, this deck is a quirky and fun tarot adventure that will bring joy to anyone who reads with them. The artist still favors muted colors but unlike her previous work, this time there is a lightness present that creates a soft and pretty hue. The images are easy on the eyes and I did not have to put on my glasses to read with them. There are fine details that merit a close inspection but again, it was much easier on to see them, which was a happy plus for me. The deck comes with a little white book that includes meanings for each card as well as for reversals (important for me as I am a fan of reversed cards). What I really found delightful was that the author named every character in the deck! There’s Jaunt the Fool with her bat companion Prudence, Discordia falling from The Tower and Nucleus the space mouse on the 8 of Wands with his alien friends Zoom and Boom – and so many others. Cassidy put full on creativity in this part and I just loved reading these descriptions. Often I will ignore the “little white book” but this one was just plain fun to read! "Joie de Vivre" -- French for "joy of living". And yes, this is a joyful, light-hearted deck that brings out the child in each of us -- something that we don't do often enough! In her introduction Cassidy notes that the living beings that occupy this realm are all sentient souls of love who want the best for those that choose to journey through their world. They will help you lighten up in order to better tap into your intuition and connect with Divine source. The Seeker will find themselves responding through heart, mind, and spirit. The presentation in the LWB (Little White Book) is what I have come to recognize as the style of U.S. Games Systems, Inc. -- text only, keywords, a short paragraph describing the energy of the card, and the upright and reversed meanings. At the end of the book is a unique six card spread entitled "Spreading the Joy", as well as blank pages for note taking. The author bio is something that you will want to read also -- because it is here that you will find that Cassidy has been a student of energy healing for over ten years, and applies her studies in Reiki and pranic healing to her visual art, and that she also composes and records songs. Certainly the energy of the healer comes through in this deck! The art is very gently done fantasy, in pastel colors. The Fool seems to be floating through the air, and there is a bit of the Mad Hatter in the Magician's top hat. 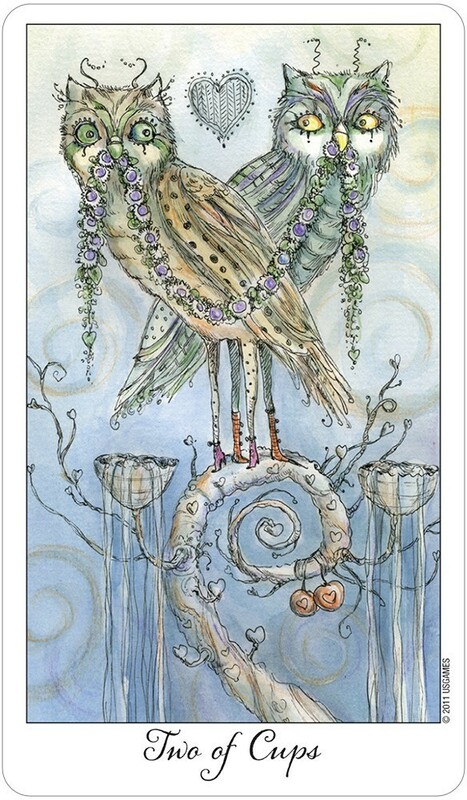 The Hanged Man hangs from a vine in mid air, while the Two of Wands is a lovely muse standing with a globe in one hand, and her owl companion appearing to be sitting on her head. This is an excellent deck to use with clients that are a little nervous about the Tarot, or to take yourself, or a client, "out of the box" in your reading. It would also be a wonderful deck to use in a comparative reading. The artwork alone is worth the price of the deck! This deck is so well conceived that each card could stand as its own little universe. In readings it communicates in a clear, rich and friendly way thanks to the lovely card images and characters that inhabit them. Cassidy adds a new cast of characters to her lively world of inner adventure. These magical illustrations lead us through the traditional 78-card tarot format with whimsy and wisdom. Beautiful to look at, and insightful in its imagery, this will make a good starter deck for those new to tarot, as well as a joyful addition for serious students of the tarot.